Silas Houghton married Alida Ann Waterman in Aug 15, 1835. Noah Houghton married Sarah Smith. Rolland Houghton married Judith Hurlburt in 1833 at Carthage, Jefferson Co., NY, USA, Houghton: 1883; MLM: Roland son of Daniel. Lucinda Fessenden married Otis Houghton, son of Daniel Houghton and Susannah Pierce, in before Aug 1, 1820 in 1820 census of Aug. 1, 1820; No record in VT or PA.
Judith Hurlburt married Rolland Houghton, son of Daniel Houghton and Susannah Pierce, in 1833 at Carthage, Jefferson Co., NY, USA, Houghton: 1883; MLM: Roland son of Daniel. Capt. 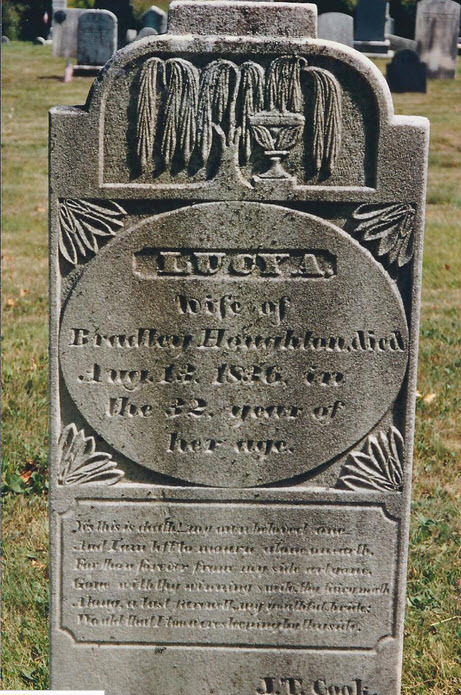 Bradley Houghton married Lucy Adams in Apr 27, 1825 at Marlboro, Windham Co., VT, USA, w/1. Capt. Bradley Houghton married Eliza Rutter in Oct 16, 1837 at Newfane, Windham Co., VT, USA, w/2; MLM: 15 Oct.
Capt. 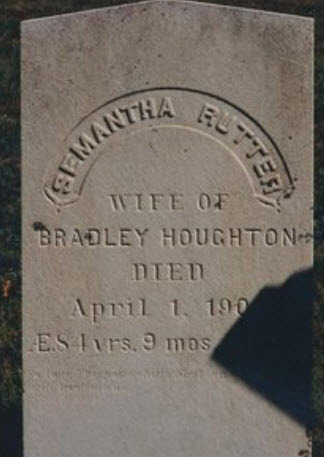 Bradley Houghton married Samantha Rutter in Feb 12, 1844 at Newfane, Windham Co., VT, USA, w/3; JWH: Feb 10. 1850 Census 1850 Halifax, Windham Co., VT, USA, Living with Israel Kellogg, 65, VT and Lydia Kellogg, 65, and Eunice Cotton, age 67, also living with them. 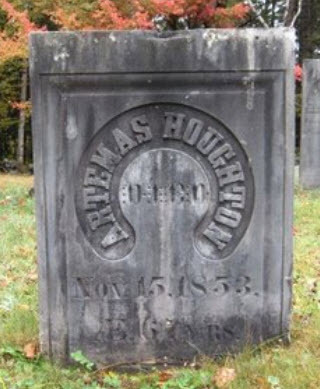 Artemas Houghton married Lois Mather in Oct 7, 1810 at Marlboro, Windham Co., VT, USA. 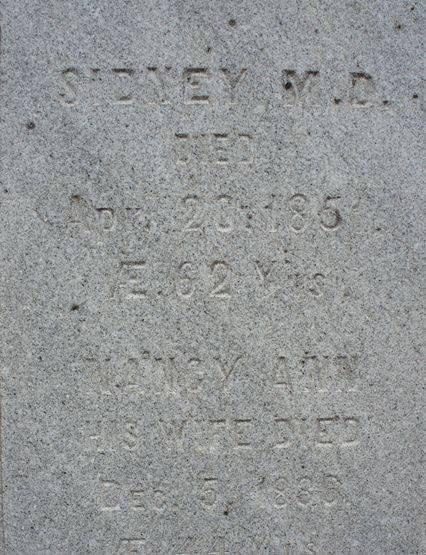 Problem GS data: states wife Nancy Ann died in 1886, age 44, implying bd would be 1842; Sidney died in 1851; she would be 9 at his death. Unclear if Nancy Ann is Eunice of 1850 census. 1860 Census 1860 Philadelphia, Philadelphia Co., PA, USA, age 56, M. L.
Dr. Charles Houghton married Eliza Woodman in May 27, 1830 at Brattleboro, Windham Co., VT, USA, VT Gazetteer Index: iii. 918. Tamar Houghton married Enos Mather in Dec 31, 1818 at Marlboro, Windham Co., VT, USA. Sally Houghton married John Wild Towne in Jun 7, 1812 at Marlboro, Windham Co., VT, USA. AE 80 yrs. 9 mo. Lucy Houghton married Capt. Ira Anson Adams in Apr 25, 1821 at Marlboro, Windham Co., VT, USA, MLM: Dec. 31 1808/1818, to Enos, son of Capt. Ira Adams. 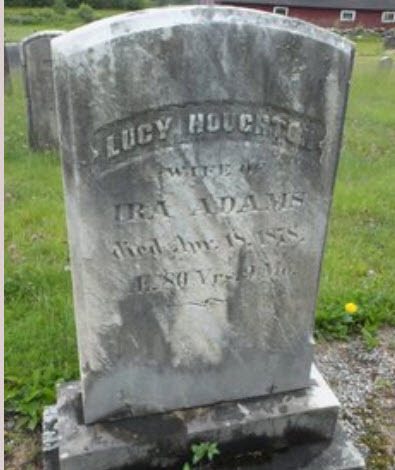 Lucy Adams married Capt. Bradley Houghton, son of Capt. Nahum Houghton and Lovisa Howe, in Apr 27, 1825 at Marlboro, Windham Co., VT, USA, w/1. 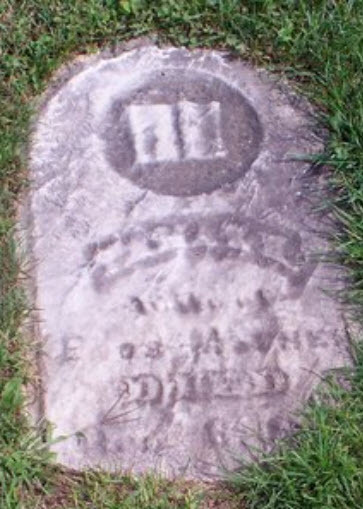 Death Mar 24, 1843 Marlboro, Windham Co., VT, USA, aged 37 yrs and 9 m.
Eliza Rutter married Capt. 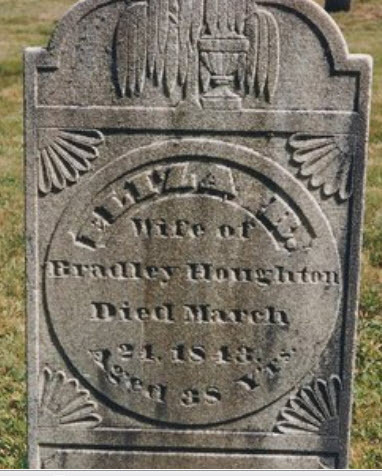 Bradley Houghton, son of Capt. Nahum Houghton and Lovisa Howe, in Oct 16, 1837 at Newfane, Windham Co., VT, USA, w/2; MLM: 15 Oct.
Samantha Rutter married Capt. 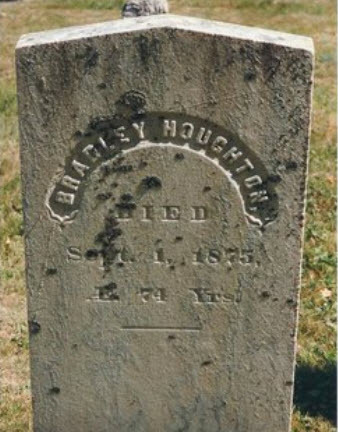 Bradley Houghton, son of Capt. Nahum Houghton and Lovisa Howe, in Feb 12, 1844 at Newfane, Windham Co., VT, USA, w/3; JWH: Feb 10. Ezra Houghton married Lucy (?) JWH has 2 Ezras with 2 Lucys. Samuel Houghton married Eliza Hinds in Nov 16, 1820 at Sterling, Worcester Co., MA, USA, MLM: Nov. 16, 1821. Sophia Houghton married Fisk Houghton in Dec 6, 1821 at Sterling, Worcester Co., MA, USA, Sophia of Sterling MA. Sally Kilbourne Houghton married Charles Griffin in May 31, 1827 at Sterling, Worcester Co., MA, USA. Sally Kilbourne Houghton married Albert Curtis in 1832. Joel Houghton married Mary Elizabeth Kendall in Nov 12, 1833 at Sterling, Worcester Co., MA, USA. Lucy (?) married Ezra Houghton, son of Benjamin Houghton and Lucy Willard, JWH has 2 Ezras with 2 Lucys. Burial Chocksett Burial Ground Cemetery, Sterling, Worcester Co., MA, USA, ae 69 w/o Samuel Section N.
Eliza Hinds married Samuel Houghton, son of Benjamin Houghton and Lucy Willard, in Nov 16, 1820 at Sterling, Worcester Co., MA, USA, MLM: Nov. 16, 1821.